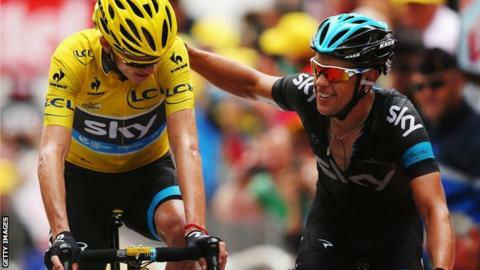 Team Sky's Richie Porte has pulled out of the Giro d'Italia in May to concentrate on the Tour de France. The Australian, 29, guided Chris Froome to the yellow jersey in 2013 and is being primed to repeat that success at this year's event, starting on 5 July. Head of performance Tim Kerrison said: "He played an invaluable role in our Tour wins in 2012 and 2013 and we want him to do the same this year." Porte was due to lead Team Sky at the Giro, starting in Belfast on 9 May. Kerrison told the Team Sky website: "Richie was always going to ride the Tour de France this year but this now means that he can fully focus on being in the best possible shape without having the added challenge of having to ride the Giro as well." Porte will join Britain's Froome in Team Sky's Liege-Bastogne-Liege line up on Sunday, 27 April. Team Sky's Bradley Wiggins, the 2012 Tour de France winner who missed last year's event, will race the Scheldeprijs on Wednesday, the Paris-Roubaix on Sunday and then take part in the Giro del Trentino, which runs between 22-25 April.